WASHINGTON — The $1.5 trillion Republican tax bill provides modest cuts for individuals, but a lot depends on a household's unique circumstances and how some of the bill’s provisions change over time. Researchers at the Center on Budget and Policy Priorities (CBPP), a center-left think tank, crunched the numbers for NBC News to illustrate how working-class households might fare. They used the methodology set out by David Kamin, a professor at New York University School of Law, and the latest version of the bill from Ways and Means Chairman Rep. Kevin Brady, R-Texas, and estimated how its benefits change over time. First they looked at an example Speaker Paul Ryan, R-Wis., brought up in promoting the bill: A married couple with two kids making $59,000 a year. Ryan estimated the family would save $1,182 a year and CBPP's estimate turned out similar at $1,106. But the picture changes after a decade: CBPP finds the same family’s taxes would be $453 higher than they would be under current law in 2027. That's because some of the bill's tax benefits, like its $1,600 child tax credit, don't grow with inflation, while some elements use an inflation formula that's expected to grow more slowly than current law. A new $300 tax credit for tax filers and family members also expires after five years, leaving it to Congress to decide whether to renew it or increase deficits beyond the current bill. Similarly, a $40,000 single parent with two kids taking the standard deduction would receive a net tax cut of $916 in 2018, but the benefit would drop to just $28 after a decade. Most middle- to low-income taxpayers are likely to see a net benefit at first, but there could be some outliers. The bill eliminates a deduction for high medical expenses, which might affect some people with expensive chronic conditions or who are dealing with a short-term crisis. Daniel Hemel, a professor at University of Chicago, used the example of a couple who spends $20,000 out of pocket on in vitro fertilization as one plausible example. Families currently itemizing who would switch to the higher standard deduction might see fewer savings than others. While most households in lower tax brackets do not itemize, the $59,000 family with two children would see only $56 in savings if they planned on claiming $20,000 in deductions and would face a net increase of $853 in their taxes after 10 years. 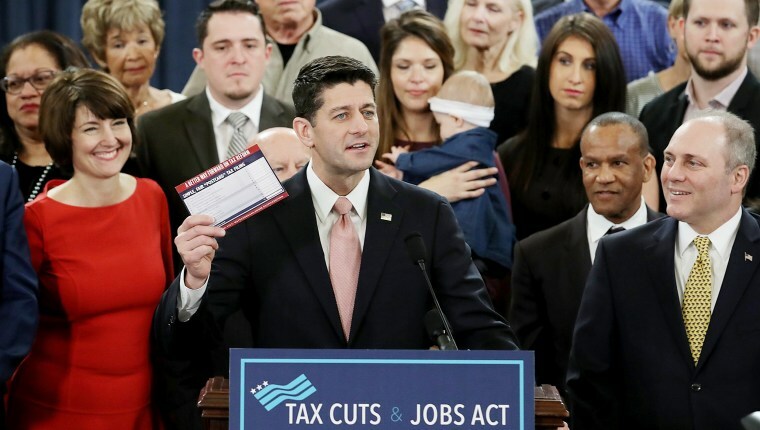 The business-oriented Tax Foundation estimated the average gains for income brackets and found the bottom 80 percent of earners would see their after-tax incomes rise between 0.8 and 2.4 percent in 2018 without factoring in the bill’s effects on growth, which are the subject of intense debate among economists. The top 1 percent of earners would gain 7.5 percent. Based on their estimates, every income bracket on average would see a tax break. But by 2027, the gains will shrink: The average tax cut will be between 0.4 percent and 1.1 percent for the bottom 80 percent. For incomes between the 90th and 99th percentile, their taxes would actually go up slightly. The top 1 percent would still see a 3.3 percent gain in income. At higher incomes, determining relative benefits gets even more complicated. At those levels, taxpayers are much more likely to itemize and the bill's biggest changes to deductions start coming into play more often. If taxes are higher in your state and city, for example, the loss of the state and local tax deduction might affect you more. If you have a large mortgage, the law caps deductions on interest payments on the first $500,000 of principal. Things get even more complicated if you’re a business owner. If you earn money in the higher brackets currently, some or all of your income might qualify for a new 25 percent pass-through rate, far below the current top rate of 39.6 percent. But it depends on what kind of business: If you're a tycoon, you might own multiple business paying the 25 percent rate on all income. If you run your own store, though, only 30 percent of your earnings might be eligible for the lower rate. And if you're an accountant or an architect you probably don't benefit at all. There's also likely a gap in benefits between the upper middle class and the outright rich, who are more primed to benefit from features like repealing the estate tax, ending the alternative minimum tax, and lowering pass-through rates.